After the WWW2008 conference ended me and guys stayed on in Beijing for a couple of days in order to take in some of the local sites. Armed with our camera’s and a subway map, Rob, Paul and Myself managed to find our way to Beijing Zoo and saw an assortment of wonderful animals – but for me it was the Pandas, that I had really wanted to see. We also visited The Temple of Heaven, which is situated near the center of Beijing. There was something wonderfully serene about the temple, that made you feel as though you’d stepped from the hustle and bustle of one world into the magical calm of another. It’s a site rich with tradition and as a temple it is beautiful to behold. 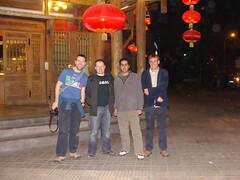 I loved the visit to China. I wish I could think of a bad thing to say but I really can’t – everyone we met was polite, approachable and kind; the sites we saw were amazing; the food was great!. I must confess there was a huge difference between the China I experienced and the China that is reported in the media here in the UK – which is the real China? I honestly can’t say, but I will cherish my memories of the place. As usual all my photo’s are on flickr, but I should warn you that I have uploaded roughly six hundred of them (out of the 1500 I took!). To make things easier if you click on any of the photos above they’ll show you pictures tagged with that specific location. Or if your prefer you can view the whole lot here. You can also see Rob’s pictures here and you can see Chris’ pictures here. The day got off to a very slow start I wasn’t feeling very well so I missed the keynote. I made my way to the Dev Track and got there in time for the first session. The opening talk was by Giovanni Tummarello on Semantic Web Pipes which seemed like a great idea. Semantic Web Pipes are analagous to the Yahoo! Pipes framework but differ in that the Yahoo framework uses RSS and the item lists in RSS do not lend themselves to the graph based modeling that RDF has. Giovanni explained that with Semantic Web Pipes you can fetch, mix and process RDF files published on the Web because the output of a Pipe is an HTTP retrievable RDF model, simple pipes can also work as inputs to more complex Pipes. have to work a day in your life"
The other talk that both Rob and I wanted to listen to was by the Sebastian Kruk on MarcOnt Mediation Services. He told us that they had completely rewritten the MarcOnt portal and it should now be available, but it wasn’t clear to me that they were planning to do anything with Marc21 or that they had engaged with any of the other people working in this area, which was disappointing. There were other talks during the day, after which we all got carted off to the evening Banquet at the Great Hall of the People in Tiananmen Square. Our colleague Jingye had told us how rare it was for anyone to be invited to dine there and that it was a very special venue – and he was right! My only regret was that I didn’t take my camera or phone with me. We had been told earlier in the day that camera’s weren’t allowed and that phones with camera’s might not be allowed either, so we decided to leave them in our hotel rooms. When we got there it was apparent many others had brought theirs with them and no-one was stopping them taking pictures – so I was kicking myself all evening. 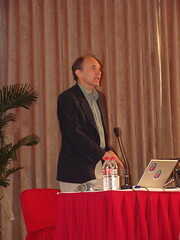 Sir Tim Berners-Lee gave his keynote before the banquet and shared with us his hopes for the WWW, many of which seemed to be centered around the Semantic Web and the Linked Data movement, both of which we at Talis are heavily involved in. Tim talked about the need to get better at communicating our ideas and to engage with each other more., about breaking down barriers and get better at communicating with each other across both the physical and social/political borders and barriers that exist. Paul has a done great writeup of the keynote over on ZDNet, so I won’t dwell on it too much – suffice to say that I thought it was great keynote, and quite inspirational in some ways. After the keynote the banquet and the evenings entertainment got under way. The food was great as were the performances, particularly one by the Peking Opera. We all had a great time. It was a very memorable evening. The full WWW2008 Conference got under way yesterday with a Opening Ceremony that involved music and dancing and fancy lights. There were some introductions from key dignatories, before the Plenary Keynote by Google’s Dr Kai-Fu Lee. He talked about Cloud Computing and explained how it liberates the user from having to remember where data is, how it enables the user to access information from anywhere, and how cloud computing makes services faster and more powerful by leveraging what could be an infinite amount of information and massively scalable infrastructure. He explained at a high level how Google uses thousands of small cheap servers rather than fewer large expensive servers in order to create a massive network of commodity servers that form its cloud, he explained how replication works and how every piece of information is replicated to at least three different servers in this cloud. we also learned a little about how Google’s Translate service works and saw some examples of how and why its better than many of the alternatives out there. After the keynote I went to to the Panel discussion on The Future of Online Social Interactions: What to Expect in 2020. The discussion was about how Online social interactions will evolve in the next decade – I didn’t get a lot out of this discussion it was hard take bits of it seriously, I found the thought that one might review someones rating, before allowing them to come over and sleep on one’s couch just a little far fetched … or am I just too cynical? 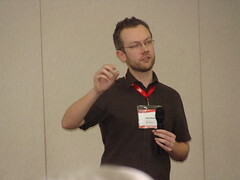 After lunch I attended the W3C Track, in which Tom would be giving his presentation on Linking Open Data. Tom presented this with Chris Bizer and they both did a great job conveying both the importance of opening up data and then linking data. Following Tom’s talk Raphael Troncy gave a short presentation on Semantic Multimedia, most of which I had already seen earlier in the week during his tutorial session on the same subject, nevertheless it was a good presentation. 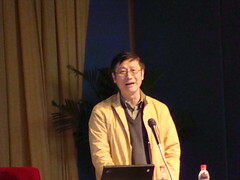 The final talk in the session was given by Huajun Chen on Semantic Web Development in China. This was a really useful talk that gave us an insight and a sense of how much Semantic Web research is going on in China – which was encouraging to hear and also very impressive. Since this was the final session of the day we headed back to the hotel. 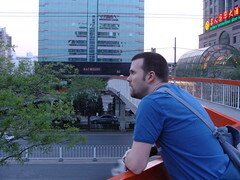 Rob suggested that he wanted to skip going to the evening Reception in favour of exploring Beijing on foot and taking some pictures. Chris and Paul decided that they wanted to go to the reception and meet up with Tom ( and make sure he came out with us for a bite to eat 😉 ) so I decided to go on walkabout with Rob. Turned out to be a great decision – I haven’t had so much fun in ages. I don’t know how far we walked but we were walking for a couple of hours, we explored the area around the new National Stadium, and whilst it is still a building site no one said anything to us in fact everyone was really polite and very welcoming. I have traveled a great deal in my life and it’s very rare that I’m out and about anywhere and don’t feel that I need to be alert in fact I’m usually always aware of my safety. Yet, yesterday, as we wandered around with our Camera’s in our hands, snapping pictures of anything and everything at dusk and into the night, I never once felt unsafe or felt the slightest bit of anxiety – I loved that. I haven’t had so much fun in very long time. 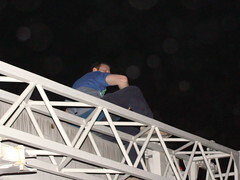 I also learned a lot about my buddy Rob, he was behaving like a school kid at times, climbing up onto pallets of bricks, or onto a crane, to take pictures, willing to walk to anyone and say hello, At one point late into the evening we stopped near the stadium and Rob was trying to ask a bunch of young police officers if they could give him permission to get onto something higher to take a picture. Obviously they didn’t understand english and he doesn’t speak a word of Chinese and yet we were all laughing as they tried to translate what he was saying. It was good to see him laughing so much …sometimes I think Rob thinks too much about things, we are both very similar in that respect, we can become hugely introspective … but I know we all need to let our hair down from time to time and just have fun … and we did! As some of the pictures show. Later in the evening Paul, Chris, Tom, Denny and Gloria met up with the two of us and we all headed to a restaurant that Rob and I had passed on our walk that we thought looked nice, it turned out to be a wonderful place and we all had a wonderful meal, before heading back to the hotel. Rob and I did walk back over to the Stadium to take some more pictures and this is when he got permission to climb up onto one of the cranes on the building site to take a few pictures. All in all I had a great time at the conference yesterday and one of the most memorable evenings I have had in a very long time exploring a strange new city with a great friend.